Cleaning soap scum off tub and shower walls and removing hard water stains and deposits around sinks, faucets and drains is never easier with this powerful formula. 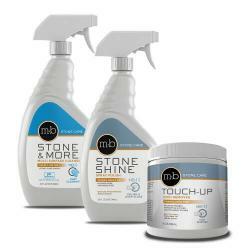 Specially designed to be safe for cleaning marble, travertine tile and limestone. 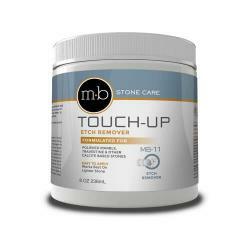 It will not damage or etch polished stone surfaces. Best used as a "regular" Bath & Shower Cleaner to eliminate soap scum and hard water build-up and prevent re-formation of films that dull tile and foster mold & mildew. Great for cleaning granite countertops, all other natural stone surfaces, quartz countertops, porcelain and ceramic tile, shower glass doors, and enclosures. Also, very effective removing grout haze left on newly installed stone surfaces. NOTE: Product is applied with a sponge. No sprayer included. 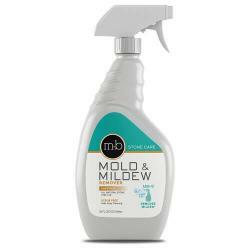 Product can be diluted with water (2 parts water to 1 part cleaner) and once diluted a sprayer can be used. Use the Trigger Spray Bottle in order to dilute the product and spray on. We had 3+ years worth of buildup around our kitchen sink on our granite countertops. I was not sure how to tell what the problem was so I emailed Countertop Specialty and their support was WONDERFUL! I sent pictures and he told me to order the soap scum/hard water remover. It did not work at first so I emailed him back for more help and he gave some tips that worked great! Now the build-up is gone and I am so pleased with the service and help they are willing to offer. The product worked well but I will say it did take some serious elbow grease to get the results. ========= Countertop Specialty comment: Thanks for the feedback. It's our pleasure to help! And yes, severe hard water buildup will take some effort and multiple applications to remove but once the area is clean it will take only regular quick and easy cleanings to maintain and keep buildup from reoccurring. First time trying the soap scum remover. Tested in small area and worked well. I bought this cleaner and it worked well. The cleaner does work as advertised! 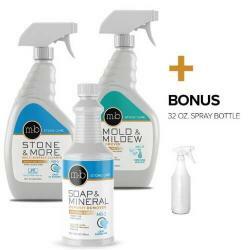 Remodeled my bathroom and needed a cleaner for my marble floors and wall. Bought this, it works Great! Your cleaner is just what I was looking for to keep my marble floor/wall looking great! Marble shower stall.......Nothing is perfect for cleaning soap scum, but this is just about perfect. Repeat customer.... the product works great, leaves the marble looking great. Very impressed with this product. Generally don't take time to review products, but with how much energy, time and money we spent on this marble shower, I'll gladly leave one for this. After install and sealing, we didn't get around to cleaning it for a few weeks so there was plenty of buildup. Areas I didn't scrub and wash off well you could see where it ate through the build up and ran down the tiles. The second cleaning was more thorough and when it dried after rinsing it looked great. I mixed 3/4 of a cup of warm water with 3/4 cup of solution and it worked great. Very impressed with this product. Generally don't take time to review products, but with how much energy, time and money we spent on this marble shower, I'll gladly leave one for this. After install and sealing we didn't get around to cleaning it for a few weeks so there was plenty of buildup. Areas I didn't scrub and wash off well you could see where it ate through the build up and ran down the tiles. The second cleaning I was more thorough and when it dried after rinsing it looked great. I mixed 3/4 of a cup of warm water with 3/4 cup of solution and it worked great. Was very concerned about the change in grout color over time dur to soap scum. Tried other marble cleaning products without success. After one application and use of a nylon brush the improvement was significant. So happy to find a product that is effective and safe to use on marble. 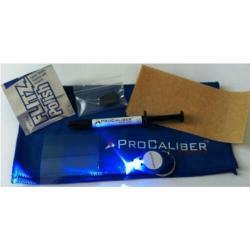 I am very impressed with the product. It worked as described as you could see the soap scum lift away from the marble. The shower looks and feels like new. Did not clean hard water deposits off of my marble sink very well. I applied at four different times waiting 10 minutes in between each and scrubbing with a bristle brush. 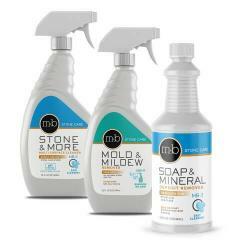 Hard water deposits have been there for about a year, maybe this product is just not strong enough. ############## COUNTERTOP SPECIALTY COMMENT: You may have mis-diagnosed the spots. If the spots have been there for a year, they are most likely etch marks and not hard water spots. The two can look very similar. Hard water deposits are difficult to remove, but this product has proven it's effectiveness over decades of use by pros. If they were hard water spots, then the Hard Water Remover would have cleaned them away, particularly after 4 applications. Please know that you may contact us at any time before and/or after purchase for guidance. We're always happy to help! We moved into a house that had beautiful black stone countertops but it quickly built up a strange white layer. i feared using just any product as i had heard warnings about the damage cleaners could cause if the correct formula wasn't used. i found this site from a google search and after reading through the wonderful information provided, i bought the soap scum remover. i had questions and the guy responded immediately! very helpful! he gave me pointers and answered my many questions. the product and the customer service are wonderful!! Received this product a week ago and tried it out on our marble shower which had some evidence of soap scum. Sprayed and waited 10 minutes and then took nylon brush and and scrubbed thoroughly and rinsed. Soap scum on shower floor and up to 2 feet high on walls look bad so had to use a scrapper and manually scrap off the residue. Then I reapplied the product same as the first time and things looked much better. I purchased the bath and shower soap film and hard water remover. 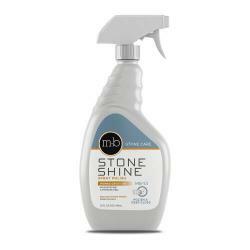 The product worked great cleaning my marble for the first time after grouting. All residue gone. This stuff worked great! Much better than anything I bought at any retail store. I thought my stone tile shower was permanently stained, but it was only soap scum and this stuff cleaned it right away with no hard scrubbing required. Happy to have finally found a safe cleaning product to use in my shower. This product works much better than those available in stores. Well worth the little extra expense. This product is great. I have tried a lot of other marble soap scum removers but none of them work as well as this product. I am a true believer in this line and am ready to buy my next product to try. So far VERY IMPRESSED! They have the best soap scum remover for marble I have ever seen! years of build up came off with one application, it looks great! I look forward to using their other products, its nice to know I will not be wasting any more money on things that clearly do not work. I was worried about how I was going to clean my marble floored shower without etching the marble. Your soap scum remover solved my problem. It made the shower floor sparkle and removed the remaining grout residue as well!